Our table centrepiece was made up of a large birthday cake surrounded by rainbow cupcakes. They took forever to make but looked so good once they were all lined up together. When the cake was cut the final rainbow surprise was revealed! Scrummy rainbow cookies made by Zara - lucky I'm on a diet because I could have scoffed the whole plate of these they were so good. Marshmallow pops made by threading large marshmallows onto a stick and then dipping them in chocolate and covering them in rainbow sprinkles. We used rainbow drops in a vase to stand up some of the pops. Rainbow fruit platter with marshmallow clouds! I love how this turned out, it's so pretty. Multi-coloured sweeties in large jars / vases. 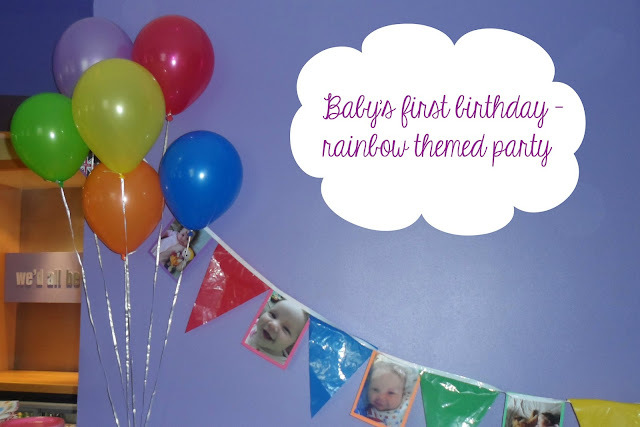 Rainbow party bags for the kiddies. Check out that spread - there was also some real food to help people out of their sugar coma! And of course the birthday girl with her beautiful mummy. She's not looking totally impressed here, I get the feeling she didn't quite appreciate all of our efforts. I'll remind her when she's older! I made Isla's little birthday outfit to go along with her rainbow party theme. I designed the babygrow and had it professionally printed. 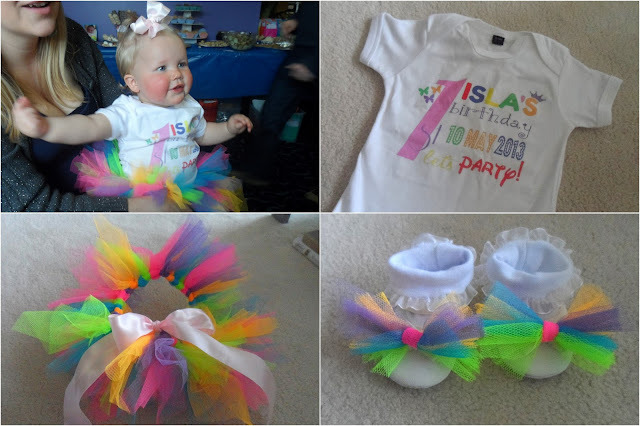 The rainbow tutu was made using a few metres of bright netting and pink ribbon I bought on ebay and I made bow for her shoes from the leftovers. I bought the baby shoes and leggings from Primark and used left over ribbon to stitch a little bow on to a hairband - shockingly she didn't pull it out of her hair! I loved that she wore the outfit I made, and that she had the decency not to throw up on it. I can't wait to find out what themed we'll get to play with next year! That birthday cake looks amazing!